"Tofu Vegetable Grill-Fry for Two"
its extremely fresh, fun & tasty. Also the nutritional values like the Vitamin A, C, Calcium & Iron percentages are VERY HIGH! Making it the perfect supper for all family members! To find out how to make this..
Dinner ready in 25 minutes! 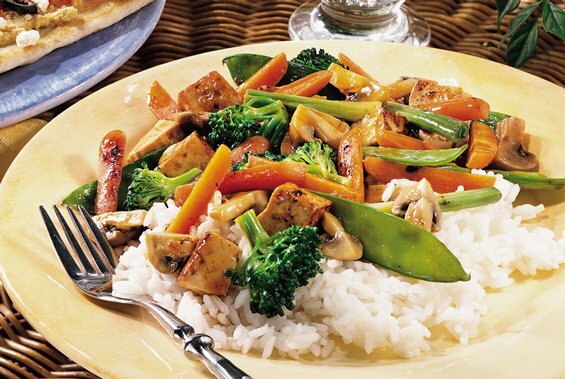 Enjoy this grilled vegetable and tofu dish that’s served over rice - perfect for an Asian meal. Cook rice in 1 1/3 cups water as directed on package. Meanwhile, drain tofu; gently press between layers of paper towels to remove excess moisture. Cut tofu into 3/4-inch cubes. Heat grill. In large bowl, combine 3 tablespoons of the stir-fry sauce and oil; mix well. Add tofu; mix gently to coat. Add broccoli, onions, carrots, mushrooms and snow pea pods; toss to coat. Spray grill basket with nonstick cooking spray. or on charcoal grill 4 to 6 inches from medium-high coals. Place tofu mixture in grill basket. Cook 10 to 12 minutes or until vegetables are crisp-tender, tossing occasionally. In small bowl, combine remaining 1 tablespoon stir-fry sauce and 1 tablespoon water; mix well. Place cooked vegetables in serving bowl. Add sauce mixture; toss to coat.